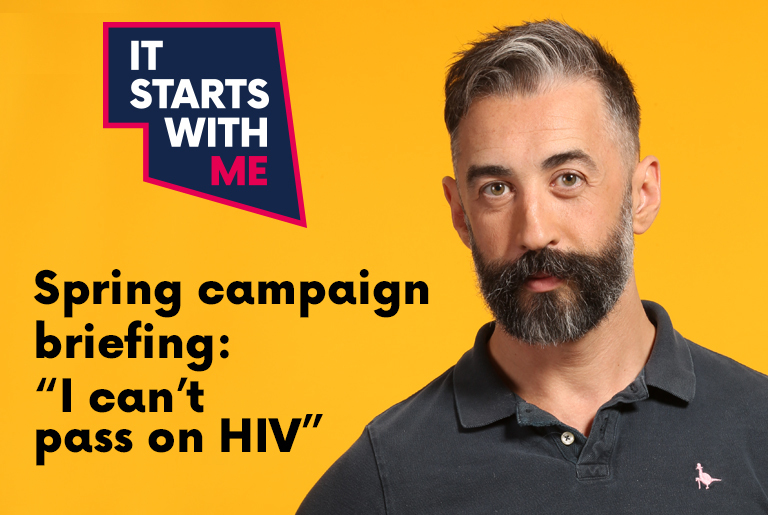 The spring phase of the It Starts With Me campaign will start on Monday 16 April 2018. The focus of this phase will be on promoting the impact of HIV medication on prevention. promote awareness and confidence in the message that effective HIV treatment stops the transmission of the virus, based on the evidence supporting this. challenge HIV stigma by sharing real stories of people living with HIV who demonstrate how effective treatment is and that they are not passing on the virus. encourage people living with HIV to continue to take treatment, both for the health benefits it produces and to stop them from being able to pass on HIV. The campaign will be delivered mainly via online and print advertising. If you would like to know more about this phase of the campaign please have a look at our Spring Campaign Briefing [PDF]. a summary of key definitions. the evidence which demonstrates the effectiveness of HIV treatment on reducing transmission. information on how you can get involved. We’ve created a social media pack to help you promote the spring campaign from HIV Prevention England. Remember to sign up to our newsletter to get the latest updates from HIV Prevention England. Working together with the PaSH partnership, we will be hosting an information seminar on PrEP in Greater Manchester. 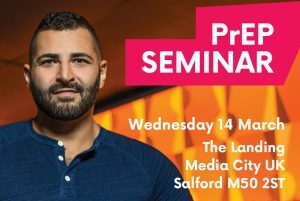 It will be free to attend and will be held on Wednesday 14 March at The Landing, MediaCityUK, Salford. the ongoing PrEP Impact Trial. how PrEP fits into the HIV combination prevention package. the role of health professionals in ensuring adequate access by those in need. The seminar targets a broad range of professionals including commissioners, HIV and sexual health professionals, community outreach workers, and general practice and pharmacy professionals. HIV testing is crucial for identifying those who are undiagnosed so that they can receive life-saving treatment early and stop the transmission of HIV. Promoting testing among trans people is particularly important because they have a higher prevalence of HIV, and general health services may not meet their needs appropriately. 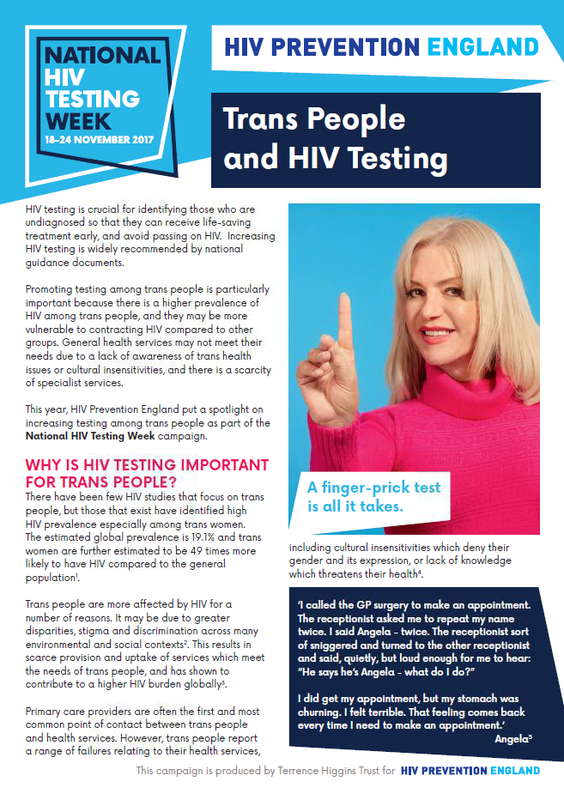 This year, HIV Prevention England put a spotlight on increasing testing among trans people as part of the National HIV Testing Week campaign. In early November, we hosted a webinar on Promoting trans inclusive HIV testing and sexual health services [PDF] in partnership with CliniQ, ClinicT, The LGBT Foundation and Yorkshire MESMAC. Following on from that, we have produced a short information briefing highlighting the reasons why HIV testing is so important for trans people, addressing barriers to HIV testing, and including helpful tips, tools and resources on providing a trans-friendly health service. 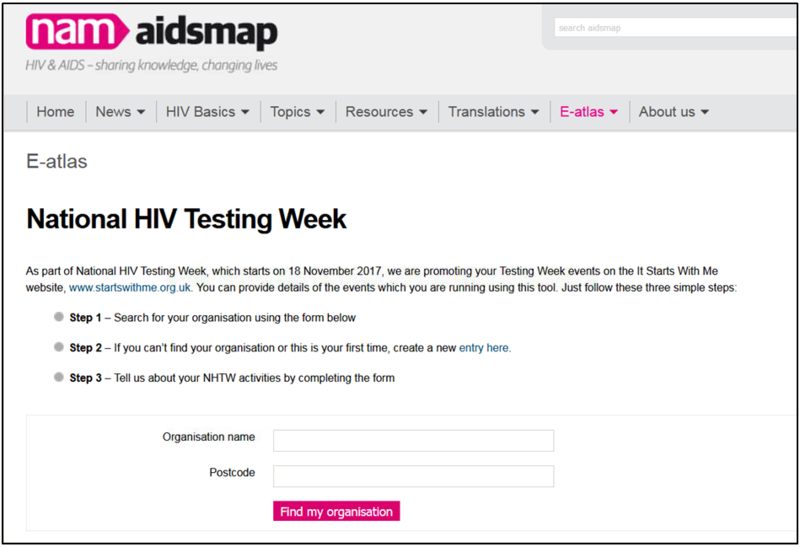 Are you holding any National HIV Testing Week activities? Would you like these to be promoted to people in your local area? Working in collaboration with NAM, we’re offering to promote your National HIV Testing Week events through our website and social media. Simply complete this brief form on the NAM website, providing your organisation and event details. Your event will be registered with NAM and then be promoted to thousands of people on the It Starts With Me website as well as on our social media channels. 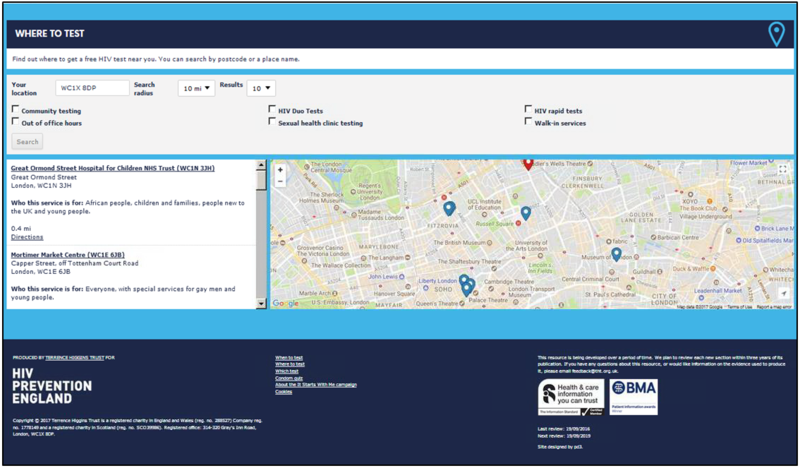 When individuals search for services in their area, your National HIV Testing Week event will show up in the results.